There's nothing inherently special about Superman: Redemption. In fact, the stories by Kurt Busiek and Fabian Nicieza collected here are essentially fill-ins that I imagine wouldn't have been collected at all were it not for the publishing delays from the Geoff Johns/Richard Donner Action Comics team. But nevertheless, I'm very pleased that DC published this collection of semi-related, thematically linked Superman stories. For those of us still struggling with the disconnect between waiting for trade paperbacks while wanting to stay current and complete with our favorite monthly titles, it seems to me this is how fill-ins should be done. 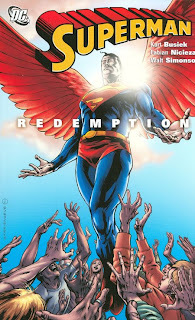 Superman: Redemption contains four issues, most written by regular Superman writer Busiek. The first uses, at least as a framing narrative, the events of Superman: Camelot Falls volume 1, placing the trade nicely in Superman continuity; the story is not essential to Camelot Falls, but serves as kind of a "behind the scenes" moment. The second two-part story is less routed in continuity, but retains characters from the first. Each of these two stories deals with a question of religion--whether Superman's super-heroic actions are worthy of religious acclaim, and second whether Superman has a right to stand in the way of divinely-motivated heroes. Busiek and Nicieza, rightly, don't venture too far into these lofty questions in such a small space, and the endings of each tale tends to avoid the larger issues--letting alone that Superman never encounters any of the actually-divine characters of the DC Universe, like Zauriel. What I did like in Nicieza's tale was the glimpse of how young Clark broke away from the religion of the Kents in the childhood; Nicieza creates powerful metaphors here for the multi-faceted relationship many people have with religion, and I thought it was well-handled. The final story, dubiously celebrating Superman's 666 issue, is written by Busiek with art by comics legend Walt Simonson. The story is a near-Elseworlds tale of Superman fighting a Kryptonian demon, and it's hard to say if the tale has any real relevance to current Superman doings, or if it was a horror tale created just for Simonson's art. There are vague, if heavy-handed, tied to Superman: Last Son here, with a dream-Lois craving "pickles and ice cream" and the demon berating Superman for having murdered, when Superman can't remember such. This opens a large can of worms, suggesting there are still characters who remember (and can therefore blame) Superman for his execution of General Zod, even as Last Son overwrites that story; had Busiek offered more of a tie to Countdown's multiple realities, I might find this suggestion fascinating instead of confusing. Still, though Simonson's art is a little "old-fashioned" for a monthly title, I enjoyed the guest appearance here. Casual readers will probably want to save their pennies and skip Superman: Redemption (at $12.99, it's about $3.25 per comic if you don't get the trade at a discount), but I'm glad to see this kind of collection. The framing narrative and efforts to ground this trade in continuity make it feel like more than just fill-in to me, and at base that's all I need to enjoy a Superman tale. On now to Flash: Wonderland, and then I'll be taking a good look at the spinner rack to see what's next. I quite liked the first story, and the #666 story was heaps of fun, arguably the single best issue of either the Johns or Busiek run as far as I'm concerned. The middle with Nicieza felt a little laboured to me (not helped by the art) but I'd happily recommend the book to any Superman fan. Jeffrey -- I liked #666, but it struck me as more of a fill-in. I'm genuinely curious -- what did you like so much about it? Lots of reasons, I guess. The opening was genuinely creepy, and everything that occurs is just so outrageous and entertaining. It's nice to see a writer, just this once, go all-out and have fun with a script and not take himself or the character too seriously. It helps that the art and hand lettering are so powerful and energetic (it's my first exposure to Walter Simonson). As a fill-in (an extra-sized fill-in, mind you), yeah I guess it didn't advance Busiek's overall arc, except that Busiek never really had one anyway other than Camelot Falls. And yeah, it might not be something I'd care to see too much of, but once in a while it's great stuff. If you like Simonson, he did a Superman special way many years ago, a remake of another Superman story where Superman fights a sand/Kryptonite monster -- anyway, if you can find it, it's a good Superman story, and it's good Simonson writing and art. Thanks for the extra input on #666; I appreciate your comments.